Ten years ago today, Grand Theft Auto III released for the PlayStation 2. It became, in the words of Time "a national obsession." In the mainstream media, it has since served as the No. 1 scapegoat for the corruption of youth through violent video games. Rightfully considered an epochal entry in video game design, the open-world, 3D Grand Theft Auto III didn't arrive as a total surprise in 2001, even to the mainstream media of the English-speaking world. 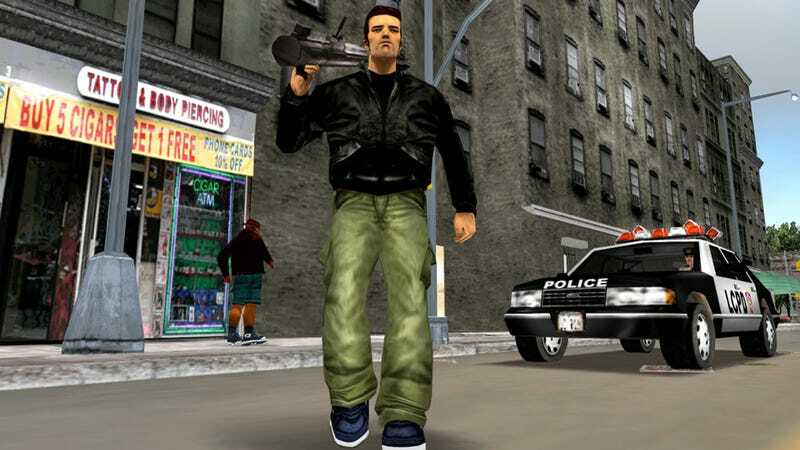 The game's predecessors in the Grand Theft Auto series had attracted condemnation from politicians and social scientists for depictions, implied or otherwise, of violent acts, especially against the cops, even before the retail release of the first game back in 1997. Grand Theft Auto III released Oct. 22, 2001. Nearly a month before was, of course, the attacks of Sept. 11. Rockstar Games' Dan Houser has admitted concessions were made to the times; still GTA III deployed to enormous commercial success and red-hot controversy. Yet even in the jaded regard of the immediate post 9/11 times, and the jingoism and paranoia for which they are remembered today, it's amusing to consider that Grand Theft Auto III might have been mainstream television's secondary target. At the time Microsoft Flight Simulator was under fire because of its realistic depiction, not just of how to fly a 747 (turned into missiles on 9/11) but also of the New York skyline and the ability to fly aircraft into real buildings. The controversy was enough that Microsoft later removed the World Trade Center from the game. According to a transcript search, Fox News—yes, that Fox News—didn't directly go after Grand Theft Auto until May 22, 2003, seven months after the release of Grand Theft Auto: Vice City. At the time Washington state was considering a law forbidding the sale of games depicting cop-killing violence. Fox's analyst, naturally, said this shouldn't pose any Constitutional problem. A court later said otherwise. So with all that out of the way, here is the first mainstream television mention, in the United States, that I can find of Grand Theft Auto III after its Oct. 22 release. It comes from the Saturday 'Today' Show on NBC, on Dec. 15, 2001. The host was Soledad O'Brien, and the speaker below is Dr. David Walsh from the National Institute on the Media and the Family. You know, I do have some problem with video games where the intended purpose, you know, is to do bad things. So, for example, right now a very popular game is Grand Theft Auto 3. The purpose of the game is to perpetrate crime. You advance in the game by getting more proficient at crime. Now, that's a game, you know, that I really have a—have problem with and certainly not appropriate for children. Grand Theft Auto III absolutely enabled many acts that cannot be discussed in polite company. Whether it condoned or instructed players in how to do them remains, to this day, the dividing line between a mainstream media that needs things to be boiled down to an easily understood intent and purpose, and artists and enthusiasts who view them in a more layered and complicated way. What Grand Theft Auto III did not do was reward anyone for their proficiency at crime, no matter how much it is accused of doing so. Not to waste too much breath on it, but that depiction assumes the game is based on a point or advancement system tied to the perpetration of crimes, as if cops and hookers are like dots in a Pac-Man game. Many of the game's core missions can be finished without firing a shot, though their purpose may countenance criminal acts. Killing bystanders or, yes, the prostitutes, is a sideshow, and speaking personally, I took great pride in completing Vice City and San Andreas without committing any violence toward either. It offends me that someone would suggest my goal in playing Grand Theft Auto was to do such things. The goal of Grand Theft Auto III was then, and still is 10 years later, only to complete the game's narrative—a mature, even sordid tale, but one rated only for adult consumption, and no worse than Taxi Driver.